This is obviously not diet food, so if a bowl of sin doesn’t scare you off, go forth! The easiest no churn ice cream with the explosive combination of peanut butter and homemade salted caramel ohmygod. Sweet, salty, nutty, caramel-y. Let’s dooo this! There’s a ton of flavours possible once you have your basic ice cream base. So far, there’s been mango cheesecake, a rich mocha and who knows what’s coming next! With each flavour addition, the texture and consistency of this ice cream seems to change a bit. This one was softer and creamier than any other, and it took 48 hours for it to freeze to a scoop-able stage. In contrast, the mango one froze in no time, possibly because the water content made it easier for it to freeze? The combination here of the caramel and peanut butter, with the condensed milk creates a rich, thick ice cream. 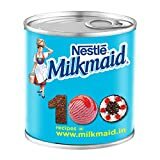 I’m therefore recommending a smaller amount of condensed milk here, letting the caramel compensate for the sweetness and stickiness that you would otherwise have. Balance, balance! Chopped Reese’s cups make a GREAT mix-in here, as would chopped peanuts as a garnish. I even broke some bits of browned butter tuile (coming next week!) and stuck them into a couple of scoops, so delicious. It does soften fast, but who doesn’t like ice cream a little melty, right! As long as you give it enough time to freeze, you’re good to go. Drizzle with more salted caramel and be ready to be amazed. Let me know how you like this! Notes: use store-bought salted caramel only if it doesn’t have too many funny ingredients that may interfere with the freezing process. Preferably, make your own! Rich, creamy no churn ice cream with peanut butter and salted caramel! In a bowl, mix the condensed milk, peanut butter and salted caramel until smooth. In a separate bowl, beat the whipping cream on medium speed with a hand mixer until it thickens and forms stiff peaks. I've found softer peaks have worked for me in the past, but for this flavour, thicker cream helps with the stickiness of the caramel. Gently fold the cream into the caramel mixture. If you like, fold in chopped peanut butter cups here! Pour the mixture into a freezer safe container. Drop a few extra spoons of melted (not hot) salted caramel and swirl it around the top. Freeze for at least 24 hours, preferably 48 hours for the best scoopable texture. You can store this in the freezer for up to a month and the texture improves as the days go by 🙂 Happy eating! *I used Amul whipping cream and found it on Big Basket. Before you whip the cream, chill your bowl and beaters for 30 minutes. The cream should be chilled at least 24 hours, I normally keep the unopened carton in the fridge at all times.